For this page, we'll be using the two bar charts shown below. They show the distances at which a laser beam is an eye injury hazard (black), can cause temporary flashblindness (red), is so bright that it causes glare that is hard to see past (orange), and does not interfere with vision but is a distraction hazard (yellow). In the chart above, most of the bar length is yellow (distraction). It is hard to see the close-in hazards of eye injury, flashblindness and glare. So in the next chart, we zoom in on the left part of the bars. Note that we also change measurement units from nautical miles to feet. Click on the chart for a larger version. Click here for a larger version of just the top portion (distances in nautical miles) and click here for a larger version of just the bottom portion (distances in feet). We'll use these two charts to illustrate some important laser safety principles that apply to aircraft illuminations. Click on a button below to get more information. Laser light presents four main hazards for pilots: Eye injury (retinal damage), temporary flashblindness, glare, and distraction. The first three are the most significant because they directly interfere with vision. Distraction is less significant because it is mental and not physical; distraction can be overcome by turning one's attention back to flying the plane. At first glance, the distances involved look enormous. For example, a 1 watt green handheld laser can be a distraction up to 25.5 miles away from the source. But note that the most significant hazards -- eye injury, flashblindness and glare -- occur at a much shorter range. For the 1 W green, glare is gone by 2.5 miles from the source. This is still a long distance, but of course much less than the 25.5 mile distraction hazard distance. For some of the other lasers on the chart, the significant hazard distances for eye injury and flashblindness don't even show up at this scale. Thus, the first principle: The most significant laser hazards -- eye injury, flashblindness and glare -- occur relatively close to the laser, compared to the distraction hazard. The next principle explains this in more detail. For all visible lasers, distraction is always 90% of the total visual hazard distance. Said another way, flashblindness is always the first 2.2% of the total visual hazard distance, glare is always the next 7.8%, while distraction is always the remaining 90%. That leads to a quick tip. If someone says “This 1 watt laser is a hazard to 25.5 nautical miles,” you can instantly calculate that the flashblindness and glare visual hazards will be within the first 10% (2.5 NM). The remaining hazard distance (22.5 NM) will be distraction. This 10/90 rule holds for the visual interference hazards (not for the eye injury hazard) of any type of visible laser. This was briefly said in item #1, but it bears further discussion: Distraction is NOT a visual interference. The light is not interfering with vision (unlike glare and flashblindness which does make it hard or impossible to see). Instead, distraction is a mental hazard. The light is brighter than city or airport lights. For pilots who know what to do, they can simply ignore the light — it is not interfering with vision — and can turn their attention back to flying the plane. This is important, because if you read something like “a 5 mW green laser pointer is a hazard to 2.1 miles”, this really means that for 10% of that distance (0.2 miles or 1097 ft) the light can interfere with a pilot’s vision. But for the remaining 90% of the distance (1.89 miles or about 10,000 ft) the light is a distraction — it does not interfere with vision. Again, a pilot with education and training can easily overcome the distraction. Look at the 1 watt green and blue lasers. Note that they both have the same eye injury hazard distance, 733 feet. Yet they have vastly different visual interference hazard distances. As shown below, a green 1 watt handheld can cause glare within 15,509 feet while a 1 watt blue handheld can cause glare at a maximum of only 2,867 feet. 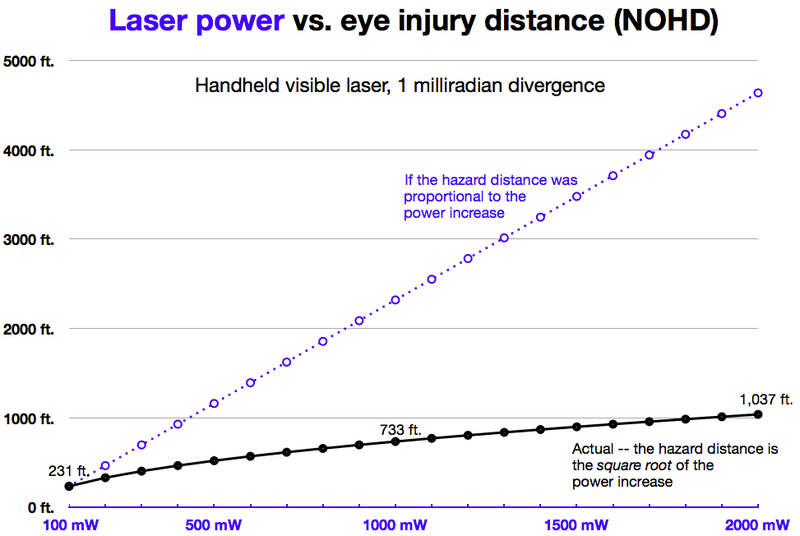 This illustrates how, for consumer laser pointers and handhelds, the eye injury hazard depends only on the laser’s power and divergence. It is independent of color. However, the visual interference hazards -- flashblindness, glare and distraction -- also depend on the laser’s color (wavelength). This is explained by the next principle, that green laser light is more visible than equivalent red or blue laser light. That's because the human eye is most sensitive to green light. The curve below shows this more precisely. 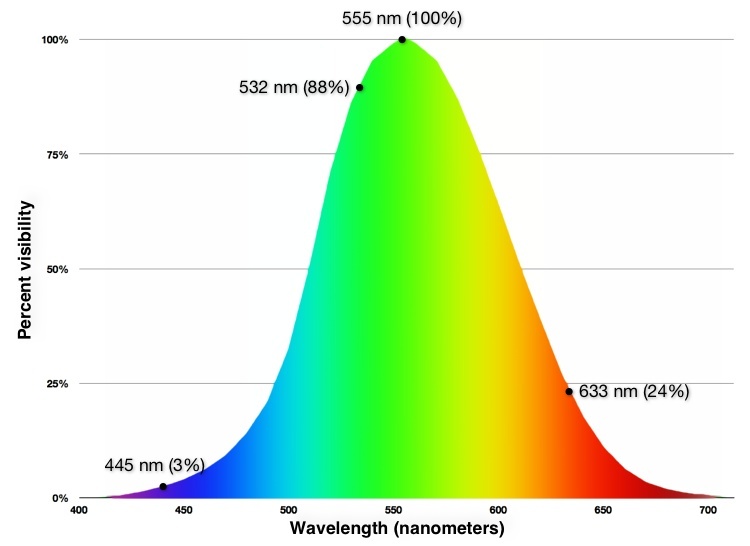 Green light at 555 nanometers is the most visible (100%). Most green consumer laser pointers and handhelds emit 532 nm light. This is perceived as being 88% as bright, compared with the potential maximum (555 nm light). For red light at 633 nm, the eye sees it as only 24% as bright as 555 nm light. This color sensitivity curve is plotted directly from the Visual Correction Factor table used by the FAA in Advisory Circular 70-1 to evaluate outdoor laser operations. Click on curve to enlarge. Here is a comparison of two 1 watt handheld lasers. One is green at 532 nm (88% apparent brightness) and the other is blue at 445 nm (3% apparent brightness). The green has a visual hazard distance of 25.5 NM, while the exact same laser in blue has a visual hazard distance of only 4.8 NM. The green laser’s visual hazard distance is 5.3 times the blue laser’s. #6: The effect of the laser’s color on visual hazard distances is not linear -- it is the square root (e.g., has less effect). 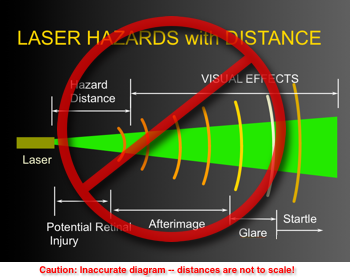 If one laser is twice as visible than another, that does not mean that the visual hazard distances are also twice as great. In fact, the visual hazard distance will be the square root of the color difference; or only 1.4 times as great (1.4 is the square root of 2). We bring this up primarily to show that laser hazard calculations are not always intuitive. Even though the green laser’s color is 4 times as visible as a red laser with the same power and divergence, this only increases the visual hazard distance by a factor of 2 (the square root of 4). The diagram illustrates that there is not a linear relationship between power and hazard distances. Instead, the hazard distance increases more slowly -- as the square root of the power difference. In the above example, the power increased 100 times (5 to 500 mW) but the distraction hazard distance increased only by the square root of 100, or 10 times. This is an important principle. It is also a bit of good news for pilots. As consumer lasers continue to be more powerful, the hazard does not go up linearly. The chart below shows this more precisely. A 100 mW visible laser has an eye injury distance (NOHD) of 231 feet. If the NOHD increased linearly along with the power, then for a 1000 mW laser (10 times the power) the NOHD would be 2,310 feet (10 times the original NOHD). Similarly, for a 2,000 mW laser the NOHD would be 4,630 feet (20 times the original NOHD). This is shown by the dashed blue straight line. However, the NOHD does not increase linearly. The actual NOHD for a 1000 mW laser is 733 feet, and for a 2000 mW laser is 1,037 feet. This is shown by the solid black line. As you can see, the hazard increases much more slowly. From 100 mW to 1000 mW (10 times the power), the actual hazard increase is only 3.2 times -- the square root of 10. From 100 mW to 2000 mW (20 times the power), the actual increase is only 4.5 times -- the square root of 20. This relationship holds for any of the hazard distances: eye injury (NOHD), flashblindness, glare and distraction. As a laser’s power increases, the hazard distance will increase more slowly. Specifically, the hazard increase is always the square root of the power increase. The charts on this page assume all lasers have tight, narrow beams that have a low 1 milliradian divergence. This is achievable for lower-power pointers. However consumer handheld lasers above roughly 300 milliwatts usually have a 1.5 or 2 milliradian divergence. This would reduce the hazard distances by a factor of 1.5 or 2 (e.g., it makes the hazard distances shorter and thus safer). Here is an example of how this works in the real world, looking at powerful lasers of around 1 watt. The best known “1 watt" blue laser is the Wicked Lasers Spyder III Arctic, introduced in June 2010. In mid-2011, Wicked Lasers brought out a green version, the Spyder III Krypton which is available in a "1 watt" version. Although these are marketed as 1 watt (1000 mW) lasers, the actual power is in the 700-900 mW range. In addition, the beam divergence is at best 1.5 milliradians which is more than the 1 mrad used in the charts on this page. These two factors will shorten the hazard distances -- making a safer situation for pilots. The chart demonstrates that there can be a significant difference between how a perfect laser operates and an actual laser. In the real world, lasers may not reach their maximum stated output value. Also, a narrow 1 milliradian beam is difficult to achieve for consumer-grade, reasonably priced Class 3B and 4 handheld lasers (above 5 mW). We then chose a range of Class 3B lasers: 25, 125, and 250 mW. These represent higher-powered handhelds that are readily available on the Internet. Costs are roughly USD $25 to $150. The 500 mW laser is at the lowest limit of Class 4, the most hazardous laser classification. The 1 watt green and blue lasers are among the highest powered handheld lasers widely available at this time (late 2011). A beam divergence of 1 milliradian is used for all lasers. This is so we are comparing "apples to apples". However, for consumer pointers and handhelds above roughly 300 mW, it is more likely that the divergence really is closer to 1.5 or 2 milliradians. A larger divergence means the beam spreads out faster. This is safer for pilots (lower power density). The effect is to make the hazard distances shorter. So keep in mind that the charts are showing worst-case, tight beams with a 1 mrad divergence. Distances on the charts are from standard laser safety sources and from U.S. Federal Aviation Administration calculations used to evaluate outdoor laser operations (Advisory Circular 70-1). For eye injury distances, the Nominal Ocular Hazard Distance (NOHD) is used. For visible lasers such as pointers and handhelds, the maximum permissible exposure is 2.54 milliwatts per square centimeter. The NOHD is a standard laser safety concept. It expresses the “nominal” and not the actual distance at which a laser is deemed eye-safe. Keep in mind that the NOHD includes a safety factor of approximately 2/3. Example: for a 1 watt 1 milliradian visible laser with an NOHD of 733 feet, this means that under ideal conditions the laser has a 50% chance of causing a minimally detectable retinal lesion in the eye at 1/3 the NOHD distance, or 244 feet. The remaining 2/3 of the distance (489 feet) gives an additional safety factor. Obviously, the longer the distance from the laser, the lower the chance of eye injury. At 733 feet, there is essentially no chance of causing a retinal lesion in the eye. For flashblindness, the FAA’s Sensitive Zone Exposure Distance is used. The maximum permissible exposure in this area is 0.1 milliwatts (100 microwatts) per square centimeter. 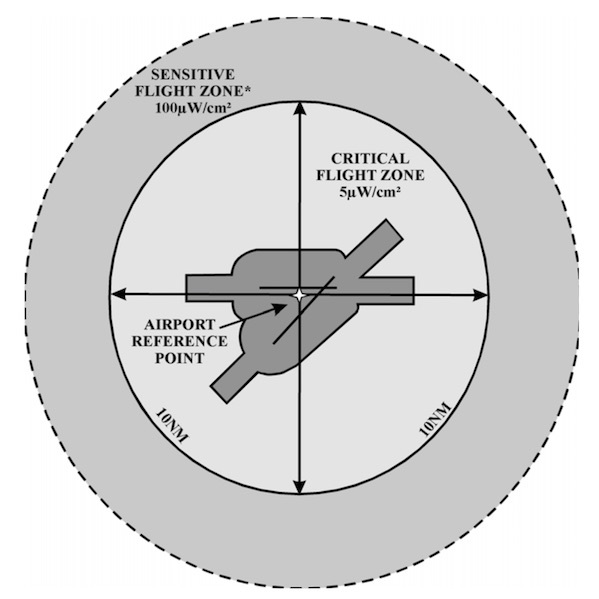 For glare, the FAA’s Critical Zone Exposure Distance is used. The maximum permissible exposure in this area is 0.005 milliwatts ( 5 microwatts) per square centimeter. For distraction, the FAA’s Laser-Free Zone Exposure Distance is used. The maximum permissible exposure in this area is 0.00005 milliwatts (50 nanowatts) per square centimeter. The charts on this page are unique. They show the correct proportions of the eye injury and visual hazard distances, for a number of lasers. This slide gives a false impression -- that’s why we had to add the red circle/slash and the red Caution note underneath. On this slide, the distances are all mis-proportioned. For example, the eye hazard distance, and potential retinal injury distances, are incorrectly shown as about 1/4 of the total hazard distance. Also, the afterimage (flashblindness), glare and startle (distraction) distances are shown as being roughly equal, which is also wrong. We hope that by presenting accurate charts, people will have a better grasp of lasers’ real hazards. For pilots, this may help them understand that the most significant hazards are very close to the laser. They should realize that for 90% of a beam’s hazard range it is a distraction, but not a visual impairment. 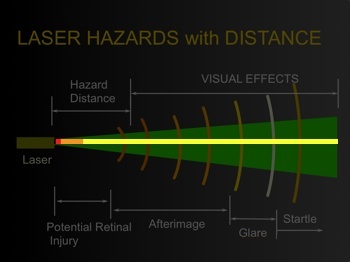 Similarly, the eye injury hazard distance (NOHD) does not mean that a laser is likely or even capable of causing injury over the entire distance. Remember that there is a built-in safety factor of about 2/3. If a pilot is hit by a laser at 1/3 of the NOHD, there is a 50% chance of a detectable retinal lesion being caused, under the worst-case circumstances (both the laser and the pilot’s eye are not moving relative to each other). Here is an example: For a 1 watt laser with an NOHD of 733 feet, the 50% worst-case chance is at 244 feet (1/3 of 733). By about 500 feet (roughly 2/3 of 733), the possibility of a minimal injury is almost non-existent. It is a fact that a laser illumination of a pilot can be hazardous. Laser incidents need to be reduced as much as possible. When pilots are in a critical phase of flight such as landing, takeoff or helicopter operations, they should not have their attention and/or vision impaired. On the other hand, pilots need to be reassured that the chance of eye injury (retinal damage) is practically non-existent. They also should know how to “recognize and recover” from distracting or vision-impairing illuminations.